Marchionne: Fiat expects to boost its Chrysler stake to 25 percent this year by meeting a target to introduce its 500 small car in the U.S.
TORONTO (Bloomberg) -- Chrysler Group CEO Sergio Marchionne said the carmaker may undertake an initial public offering next year and he prefers that General Motors Co. goes first. “Probably 2011,” Marchionne said when asked about the timing of a listing. May is “turning out to be a good month” for sales and the U.S. market is “on the mend,” he said. 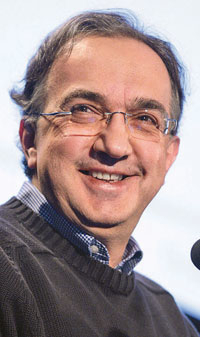 Marchionne, who is also CEO of Fiat S.p.A., plans to list Chrysler and spin off Fiat's automotive operations from divisions that make trucks and tractors. He has said Fiat expects to boost its Chrysler stake to 25 percent this year by meeting a target to introduce its 500 small car in the U.S. He said there will be enough investor demand for both Chrysler and GM to sell shares to the public during the next year or so. “I think there is enough appetite, and I am always respectful of the bigger guy,” he said, referring to GM, led by CEO Ed Whitacre. “Let him go, he's been itching to go. I spoke to Ed a while back, he wants to go public,” Marchionne told reporters in Toronto on Thursday. Fiat acquired a 20 percent stake in Chrysler after the U.S. company reorganized with $15 billion of government support. Chrysler exited bankruptcy in June with government aid. Fiat can obtain as much as 35 percent of Chrysler. The U.S. has about 9.9 percent, Canada owns 2.5 percent and a United Auto Workers trust for retiree medical care holds 67.7 percent, according to bankruptcy court documents. GM Chief Financial Officer Chris Liddell said May 18 the automaker's $865 million first-quarter net profit is a “good, useful step” on the way to an initial public offering that may come this year. Since exiting bankruptcy in 2009, GM has repaid the $8.4 billion in loans from the U.S., Canada and Ontario, leaving the U.S. with $42.2 billion in common equity and preferred stock, a senior administration official has said. Marchionne said Fiat hasn't been affected by the European debt crisis, either in the cost of financing his company's operations or in consumer demand. The situation is a chance to improve how the euro zone functions, he said in an interview.